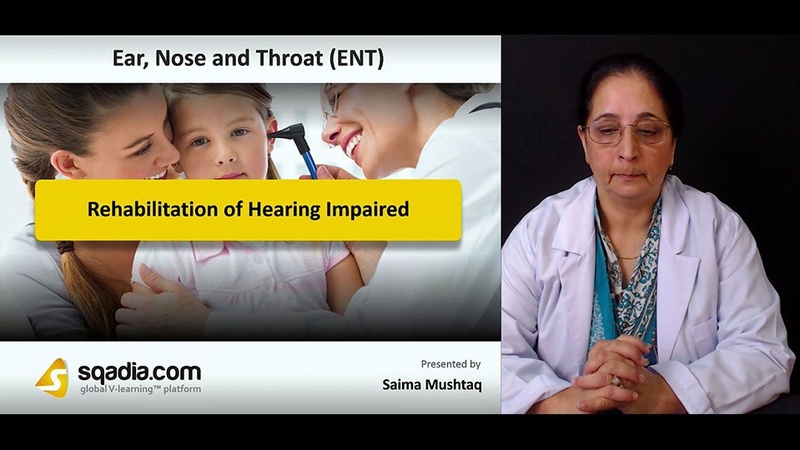 This lecture aims at discussing about the Rehabilitation of Hearing Impaired. The main focus of section one is on the Instrumental Devices. The educator commences by talking about the Rehabilitation for Communication which is succeeded by a description of Instrumental Devices. Moreover, certain Types of Hearing Aids have also been elaborately explained. 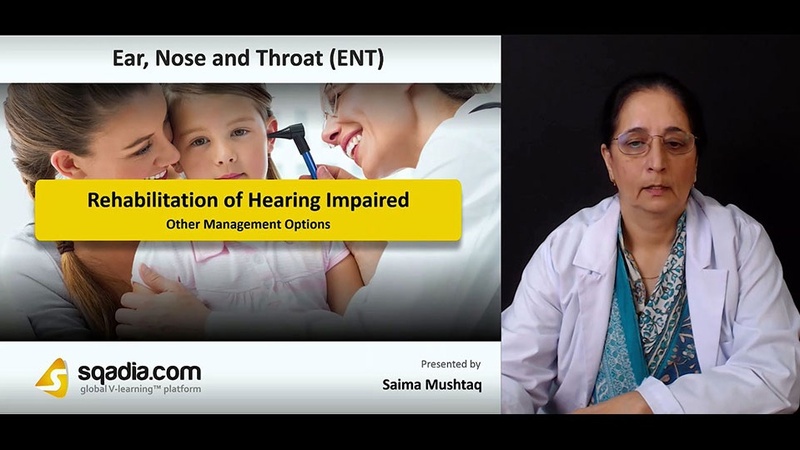 The educator moves on to speak about the Indications for Hearing Aid and Fitting a Hearing Aid, respectively. Furthermore, Disadvantages of Conventional Hearing Aids have also been presented. In the end, the educator has concluded by reporting the Contralateral Routing of Signals (CROS). 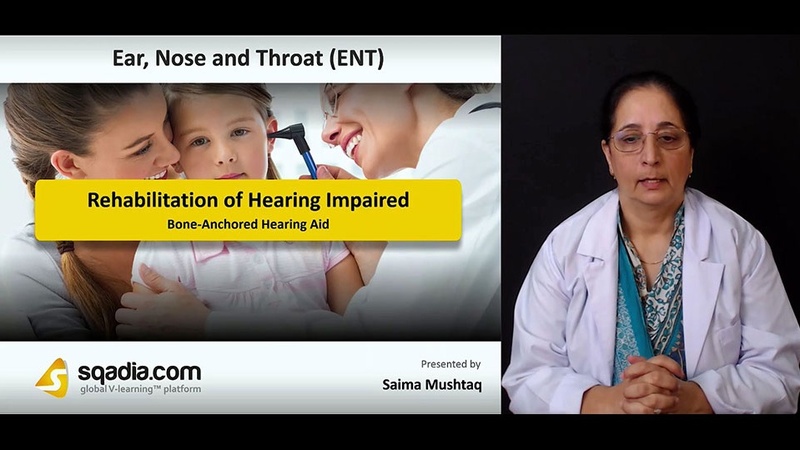 Section two talks about the Bone-Anchored Hearing Aid in-depth. In the beginning, the educator has communicated about the term Bone-Anchored Hearing Aid (BAHA). This is followed by an elaboration of the Candidacy Profile and some Indications. In addition to this, the educator has also reported about Surgery. Ultimately, the educator has wrapped up by mentioning about a number of Complications. Section three accommodates the Implantable Hearing Aids. Initially, the educator mentions about the Implantable Hearing Aids. Afterwards, Electromagnetic Hearing Devices and Vibrant Soundbridge Device has been shed light on. Alongside this, the educator brings into consideration the Candidacy Profile which is succeeded by a detailed overview of the Procedure. The section has then been summed up at the explanation of the Advantages. The prime focus of section four is Cochlear Implants. The educator started off by speaking about the Cochlear Implants. Furthermore, Components and Functioning has been reported. Moving forward, the educator explains the Candidacy Profile. In addition to this, Outcomes and Evaluation has been considered. Subsequently, Surgery has been elucidated. Later on, the educator moves on to discuss about Postoperative Mapping (Programming) of Device and Habilitation process. Towards the end, the educator has concluded by highlighting the Complications. The objective of section five is to talk about the Other Management Options. The educator begins by elaborating a type of implant which is termed Auditory Brainstem Implant (ABI). Besides this, Assistive Listening Devices And Systems together with Alerting Devices have also been delineated. Moreover, certain Telecommunication Devices have been discussed about. This section concludes by underlining the role of Training in management.